Image captured from video on Sport Singapore's YouTube channel. Perhaps, in the long run, chopping and changing the team from the one that narrowly lost to Singapore in the SEA Games will ultimately be beneficial to Philippine football. Young players do need experience to grow; and this one does not get playing EA Sports FIFA 2015 on Play Station. Perhaps, too, the coaching staff was wary that there was a mere day’s interval from the Singapore match and wanted fresh legs against a team that was debuting in the tournament. This probably would have made a lot of sense if the squad had depth. What we all know after last night’s disjointed first half in a chastising 1-3 loss to Cambodia is that we probably would have been better served by taking along the youngsters culled from the World Cup qualifying squad. It did not help that Julian Clarino, excellent against Singapore, did a Steven Gerrard early in the match. The Cambodians could not score from the chance created by the slip; but the young Azkals seemed unnerved by the close shave. The team totally lost focus and gave one of the worst Azkals performances that I have seen in recent years. It was barely recognisable from the one that played so gallantly against Singapore. The young Azkals were completely overrun in midfield by what in all honesty was a fairly ordinary Cambodian team. Moreover, they often had difficulty completing routine 10-yard passes and played as though they had not been properly introduced to each other. Where was the team that cheekily and neatly passed its way out of the defensive line against Singapore? The deep defensive line, in hindsight, also looked like tactical suicide. It gave the Cambodians acres of space to weave their patterns. Before long, they were two goals to the good, leaving the Philippines with a mountain to climb. It was unfortunate that Arnel Amita did not start as the Philippines needed a playmaker to string together the team’s passes. Amita was restored late in the first half and orchestrated an improved overall performance in the second half. The damage was ultimately done, however, in that terrifyingly poor first half. The Cambodian press eased off in the second half as the players tired, allowing the Philippines to come forward. This inevitably left holes at the back; and Cambodia scored against the run of play to pad their lead. 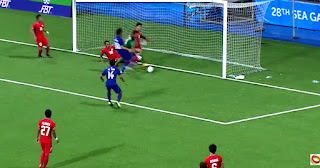 In truth, the defeat could have been more emphatic had the Iranian referee Mooud Bonyadifard not erroneously ruled out for offside a perfectly legitimate Cambodian goal. mage captured from video on Sport Singapore's YouTube channel. At the Liverpool FC Academy, coaches have a real go at players for even something as seemingly innocuous as a swearword during a match. Players are taught an early age the proper football ethic and to never resort to actions that can get themselves sent off. No coach wants a mousy little player who sulks in the corner, and there is often a thin line between being combative and being stupid. At the end of the day, a player can be of no service to his team if he is sent off and gets suspended. I am referring, of course, to the Amita red, helped it has to be said by theatrics from the Cambodian player. The foul that earned him a second yellow was totally unnecessary, the sort that coaches around the country ought to be teaching youngsters not to be committing. And especially so in stoppage time. Amita’s performances in the two games of the SEA Games have caught the eye. However, he will be of no help to the team in the next match against Myanmar watching from the stands.